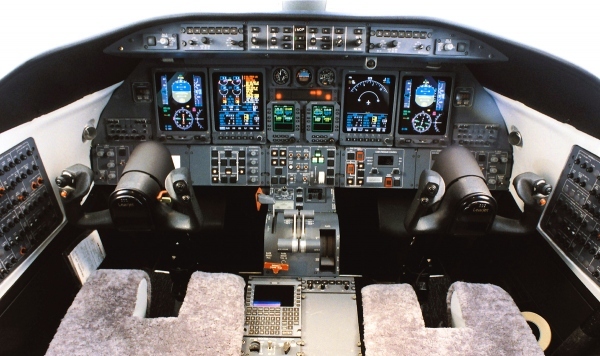 The Learjet 45 Avionics system is the Honeywell Primus 1000. 2 primary flight displays and 2 multi-function displays are apart of the Learjet 45 avionics. The four displays are the Honeywell DU-870 and are 3.7 inches x 8 inches. An Engine Instrument and Crew Alerting System (EICAS) is also integrated in the Learjet 45 avionics. Also apart of the Learjet 45 avionics is the Flight Management System (FMS) unit located in the cockpit. Usually the FMS unit in the Learjet 45 is the Universal UNS-1 FMS. One or two of the FMS units are located in the flight deck and newer Learjet 45s have different newer version of the FMS. The Learjet 45 XR avionics are mostly the same as the Learjet 45 because they are actually the same aircraft. Also Learjet 45 avionics meet the Required Navigation avionics (RNP) standards and can be RNP capable. The Bombardier Learjet 45 avionics are also referred to as the LJ45 avionics and the Bombardier Learjet 45 XR avionics.